I’m slowly making progress on cleaning up my No. 4 and the other day I ran into a strange issue. Hoping others can shed some light on the situation. After re-timing the carriage I noticed it wouldn’t return all the way to the feed board. 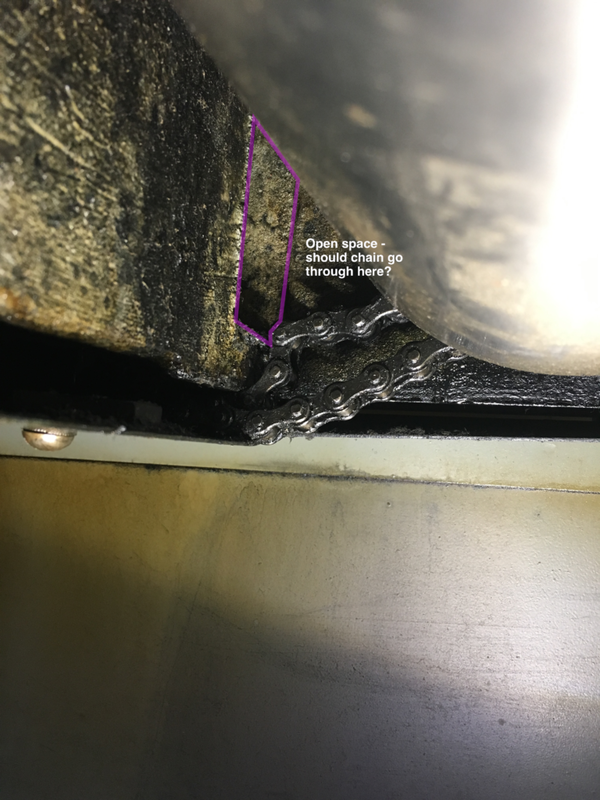 It seemed like the trip wedge wasn’t being pushed out far enough – and when I looked under the press I noticed the chain seemed like it was in the way and also jammed. So, my question is – should the chain actually be above where it currently is e.g. in the open space above the casting? Also, it seems like this would prevent the chain from interfering with the block that engages the trip cam. 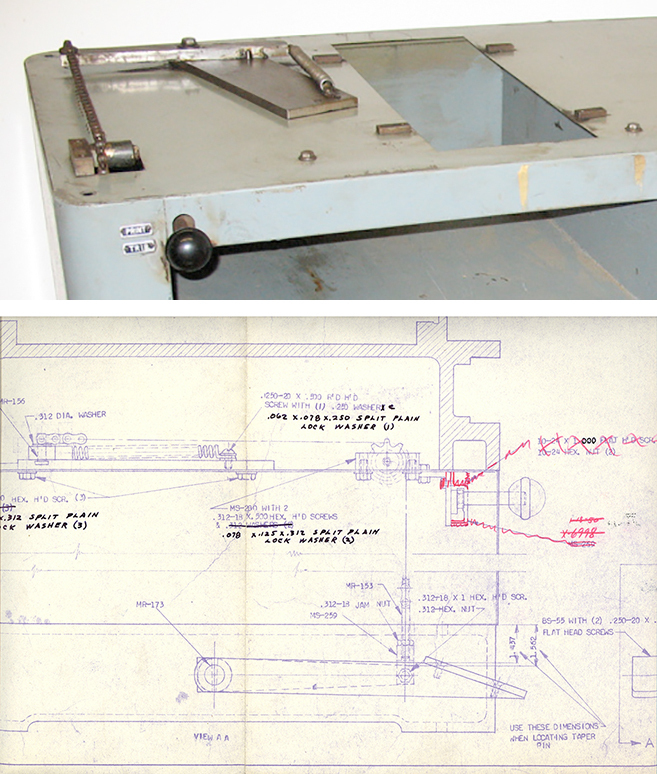 I should have clarified – when I push down on the pedal, and the block that pushes out from under the press bed and engages the cam (MS-129) seems to be getting caught up on the ink roller chain due to its current position rather than being where it should (the hole in the bed casting). The chain activated by the pedal is independent of the one that drives the ink drum. Thanks for the reply Basil – I’ll move the chain back into the space above. Still can’t quite wrap my head around how it ended up down there. Just for some context, I did remove the carriage when I moved the press – though it wouldn’t actually return all the way even before the carriage was removed. From what I can tell, the chain is preventing the foot pedal from totally engaging the trip cam and ultimately preventing it from functioning correctly. I may be way off there – but will check it out and report back. I will look into the gripper opener interfering with the cam . Any other advice or things to look for would be much appreciated. Ink Drum Chain passes through the casting as outlined. Retiming of the cylinder suggests you removed the carriage from the bed. three possibilities why carriage is not returning to rest position. Impression bearings removed for cleaning and not reset causing the cylinder to be low and fouling the register rack. The gripper opener has been removed and incorrectly reset causing it to jamb on the gripper opening cam or possibly the carriage latch spring has shattered preventing the tie bar riding over the latch.